Act I is known as the act of Exposition. It is approximately 30 pages in length (1-30). In the opening of Act I you must set-up the problem to be solved and the dramatic question that needs to be an swered. In Act I you also introduce the main and major characters of your film. This problem will take the rest of the movie to solve. The audience must immediately know what your movie is about or they will lose interest. They should understand what's going on and care about the problem confronting the main character. I always tell my students to ask themselves when they open their screenplay: "Why is this day in the life of my character different from any other day in his life?" Something must happen to start your story moving toward a destination. What event or problem starts your main character on a journey? Is it a death, divorce, losing a job or meeting the person of your dreams? You need to know what your story is about and your viewers want to know what world you're taking them to visit, what are the rules and who are the players. There is nothing worse than reading a book or seeing a movie and not knowing what's happening. We live in an age of "I want it now," with fast food deliveries, instant microwave dinners, and drive through restaurants. Just push a button and you can buy anything you want on the Home Shopping Channel, get money from the ATM machine and instantly interact with video and computer games. So it's understandable that more screenwriters try to hook the viewers in the first three minutes, and less than ten minutes. Longer than this period of time will make your viewer bored and perhaps ask for his money back from the theater. 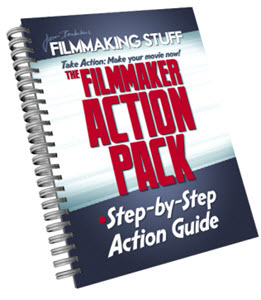 If your audience isn't hooked immediately you have failed your goal as a screenwriter. A good way to check to see if you have all the necessary elements in Act I is to ask: "What does my main character desperately want?" (His goal.) "What is the problem I'm introducing for my main character to solve?" "Am I starting my screenplay with an immediate problem?" "Do I hook and interest my audience by the first ten pages?" When you can answer "yes" to these questions, you then have the right elements for Act I. By the end of Act I, all the information should be given to your audience, and they should know what dramatic question needs to be solved. They also should have all the background and information they need to understand your story. By the end of Act I your main character is taking action and moving forward. There is no turning back. He has made a decision to solve the problem and is moving ahead.